One day I know I will laugh about the whole house situation and it will be even clearer then than it is now that God just moved. That hiccup dragged on and on, and we decided to look at some other houses (around 15 of them) just in case this one fell through. We did find another one that suited us and we felt that we would be happy in either house. And then we waited some more. A deadline was set for our original dream home and last Sunday was the day of reckoning. Just as the clock ticked down and we began to prepare an offer for the “backup home” we received word that our original contract was going to go through. Right when we were ready to give it up and move on, God moved. I wasn’t sure how to feel. I had spent an entire weekend imagining myself in one or the other of those two homes and then telling myself to stop thinking about it until we knew something for sure. Now we did know for sure and I admit to feeling a little regret over the home we didn’t buy. Our prayer had been for God to put us in the home He wanted us to have, and we believe that’s what He has done. 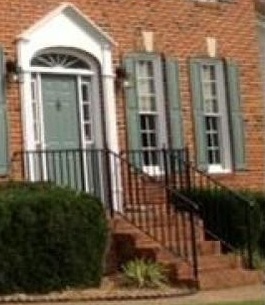 At any rate, we are moving again, almost exactly a year to the date we moved to Virginia. God has a sense of humor. He also has an exquisite sense of timing. Even when we thought He’d dropped the ball and forgot about us, He still had a plan. His timing is just different from ours, that’s all. So what did I learn from all this worrying and scurrying? First of all, I learned that worrying does absolutely nothing to move things along. It tricks you into feeling like you’re doing something, yet nothing changes. All worry does is fray nerves, steal sleep and breed impatience. It preoccupies your mind and takes your eyes off God. In Matthew 6:27 Jesus says, “Can any one of you by worrying add a single hour to your life?” Of course not! 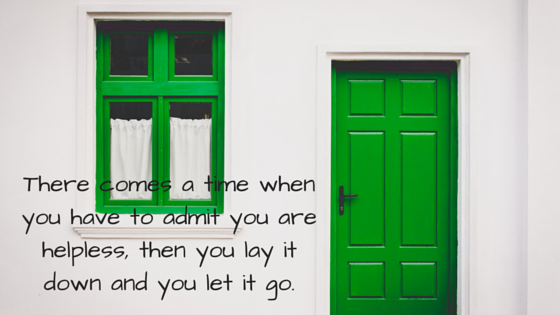 There comes a time when you have to admit you are helpless, then you lay it down and you let it go. Secondly, I discovered that it’s possible to have peace in the midst of the storm. Now, I know buying a new house is not exactly on par with a life-threatening illness or natural disaster so please forgive my first world problems. But when the Bible talks about peace that passes understanding, I know what that means. It means peace that is out of your control, peace that has no logical reason for existing. It means when you have every right to be falling apart, God sends a supernatural peace your way. Thirdly, there is overwhelming relief in laying down my burden at His feet. I had to do that over and over again. Every time it came to my mind, every time my squirrelly brain started up with the “what if?” chorus again, I closed my eyes and pictured myself opening my hands and laying my concerns at the foot of His throne. Simplistic? Maybe, but it worked for this girl. And lastly, I found that waiting won’t kill me. I am terrible at it and I make so secret about that, but I survived. I’d go so far as to say that I came out better than I started. You have no idea how much it pains me to say that. God once again proved Himself to be faithful, although He didn’t need to prove anything to me. It’s about to get all crazy up in here again as we box up seven people’s worth of stuff and move it to the new place in June, but I’m confident that God is going before us to prepare the way. At least this time we’re moving seven miles away instead of 400. If anyone needs me, you can find me behind a wall of cardboard boxes. As this post goes to press, my family is playing a waiting game concerning a very vital aspect of our lives: where we’re going to live. See, a few weeks ago our little family of four expanded to seven when my grown daughter, son-in-law, and small granddaughter moved in with us. The plan is for them to stay with us until my son-in-law finishes college, which should take a couple of years. And we are glad to have them, because up til now they’ve lived about eight hours away from us and it’s hard to be the best Nana of them all when you’re that far away. So my husband and I decided that for the sanity of all concerned it would be best to sell this house and find something roomier so we wouldn’t be all up in each other’s business all the time. We put our house on the market in early March and it sold in six days. That’s right, six days. One day I’ll get around to writing a blog post about the sheer madness of that time but it’s still a little too fresh right now for me to find it funny just yet. Our new hobby was looking at houses for sale, and there were surprisingly few that met our size and school zone criteria. After one false start with a house that had safety issues, we found it. It was (is) beautiful. It had plenty of space, a nice yard, and (wait for it…) a pool! I could totally see myself living in that house for a long time. So we negotiated and agreed on a price. There’s a contingency. Without going into too much detail, it appears that a lot of pieces will need to fall into place for us to purchase this house. It could easily go either way. And so we wait to hear, not knowing if we are moving and if we are, where exactly we will land. It’s hard to plan when you just don’t know what’s coming. Meanwhile, there’s a buyer out there with a contract on the home we now live in who is proceeding in good faith. I detest the uncertainty, yet it’s at those times of vulnerability and waiting that I can grow by learning to lean on God for peace of mind. My default setting is to worry the situation to death, imagining all possible outcomes to ensure that I’m not surprised by any of them. I try on all the resolutions for size, testing the fit and feel of each one so that whatever result I get, it feels at least little familiar. Or so I think. I don’t think that’s what God means when He tells us we can trust Him. Trusting Him means believing that He is for me and He has my best interests in mind. That’s not always easy for me. I try to insulate myself from disappointment by anticipating it. If it’s a new job, I tell myself that someone else is more qualified than I am and will certainly be offered the position. If it’s a thing (like this house), somehow it seems too good for me, like I shouldn’t aspire to such nice things. I should stick with something small and humble. (and there’s nothing wrong with small and humble, by the way) So I tell myself it won’t happen, that way I won’t be disappointed. I’m stifling any flicker of Hope, basically – not even giving it a chance. And I don’t want to be that person walking around without Hope. Apparently there’s a part of me that feels undeserving, believing that I am unworthy of whatever it is I’m reaching out for. Yet I don’t believe God sees me that way, so I’m working hard to see myself through His eyes. He loves me enough to send His Son to die for my sins. He calls me His Beloved. He works all things out for my good. I’m holding tight to those promises in the uncertainty. As I’ve written before, I’m a girl who likes to know what’s coming next. I don’t like waiting and I don’t like uncertainty. Honestly, I don’t know anyone who does. Impatience is pretty much a universal human condition, wouldn’t you say? Lately things around my house have been uncertain to the extreme. We have a dearly loved cat who has chronic health problems. We recently learned that he will be on medication and prescription food for the rest of his life. He was already high-maintenance even without the addition of meds and special food. But our middle daughter LOVES that cat, and he’s a sweet boy (for the most part) so we’re committed to dealing with the medication and food for the next few years. A few days ago I noticed that Elvis (yes, that’s his name) was looking a little scruffy. His food was going untouched. He was not grooming himself and he was “leaving his mark” in the house in places other than his litter box. This is not good for many reasons, one of which is that we just sold this house (which I will cover in the next post) and also because hello, the smell. And I don’t think I can take the sadness of my teenager if something happens to this cat. I did some research (what did we do before Google??) and started taking some steps to help him recover. I already knew from what the vet told us a couple of weeks ago that a recurrence could be the end for Elvis because there was nothing else they could do. I also started preparing my teen for the possibility that Elvis might not make it. The whole house went into Cat Watch status. And I prayed. Listen, if you don’t think God cares about the details, you are dead wrong. Nothing escapes Him. If we care, then He cares, because He loves us. Then I walked through the uncertainty. Or more accurately, I wallowed, crawled, and moaned through the uncertainty. I did what I could do and I prayed for God to do what only He could do, and I waited. Have I already mentioned how bad I am at waiting? Because I am. It seems like such a petty thing, to pray for a cat’s health, yet I believe God cares because we do. 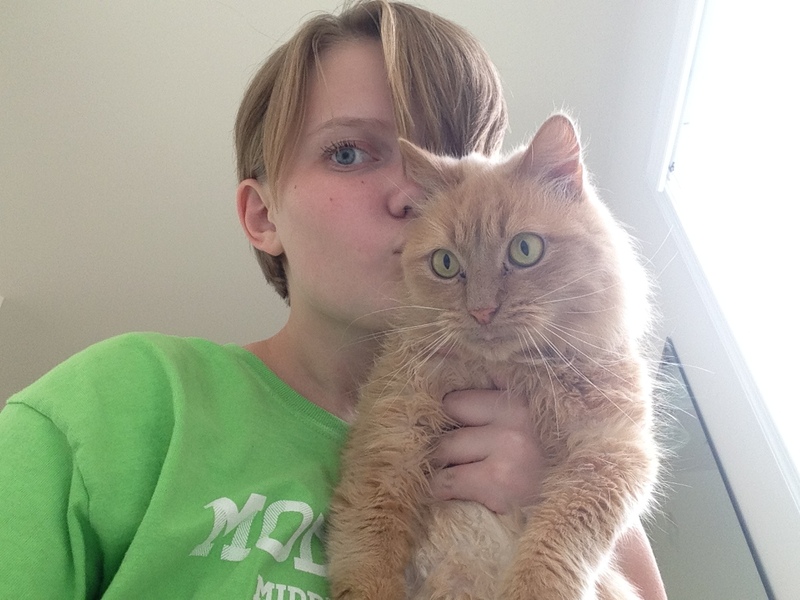 My middle girl has been through a lot of changes in the past year: moving to a new state and trying to adjust to a new school (and struggling), along with normal teenaged hormonal changes. I cannot imagine the blow to her fragile and still developing sense of stability if she lost her furry companion. But I also knew that if God allowed it to happen, He would get us through it somehow. So for the last few days I’ve been walking the tightrope of okay/not okay and trying to prepare for every eventuality, although there’s no way to really do that. I’ve been a bundle of nerves, all over a cat! And I think that while I’ve prayed for God to intervene, I haven’t allowed myself to actually believe that He would. I watched IF:Gathering online in February and near the end, the speaker asked everyone to take a rock and write on it a word God had impressed upon them. Ever since then I (along with some sweet IF:Voxer sisters – you guys know who you are, and I love you) have been challenging myself to really believe God. Believe that He is for me and my good. Believe that He is who He says He is, and His word is true. Believe that He answers prayer. Because I go to Him in prayer with all my concerns and then I’m surprised when He answers. Why is that? Am I missing something critical in my spiritual development? A sense of expectancy, perhaps? I want to be the kind of person who prays about a problem or concern and waits expectantly, knowing God will answer and that His answer will be for her good, whether the answer is “yes”, “no”, or “not now”. But I’ve also been so disappointed by people in the past that it blurs my view of my Father, and that’s not fair to Him. And in the end, even though what I was walking through was painful at the time, all those experiences have formed me into the person I am now and I can honestly look you in the eye and tell you God worked things out for my good (Romans 8:28).